There’s nothing quite like a real wood floor to add warmth and elegance to any room of the house but like any type of flooring, it requires a certain amount of TLC to keep it looking its best and to prolong its life expectancy. Regular maintenance involves little more than a sweep with a soft bristle brush or you can dust it with a dry microfibre mop. You should also clean your floors every now and again with a professional wood cleaning product as recommended by a wood floor expert. To keep your wood floors in tip-top condition and lasting for decades, we recommend a daily sweep or mop, a weekly vacuum using a bare floor setting and a monthly clean with recommended floor cleaner. About every 3-5 years you might want to consider applying a maintenance coat, and after you’ve reached the 10 year period it may be necessary to sand and refinish your floor. Don’t use products intended for vinyl or tile on your wood floor as the acrylic waxes contained within can make the floor become dangerously slippery and dull the appearance of the wood. Do use area rugs at doorways to help prevent debris from being brought in on the bottom of shoes which could scratch your floor. 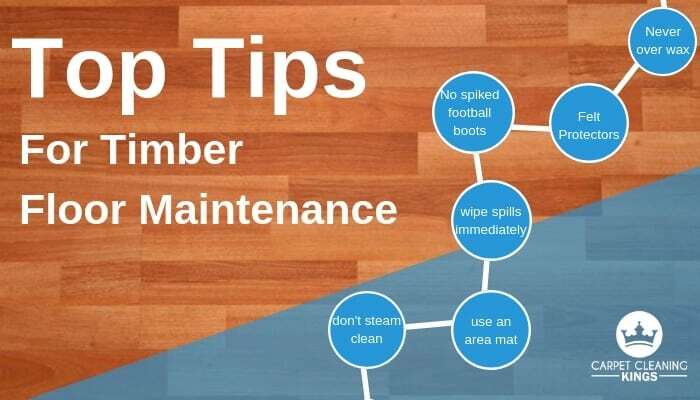 Don’t be tempted to wet mop a wood floor or steam clean it. Both steam and water will dull the finish and may even damage the timber. Never over wax a wood floor. Instead, it starts to look dull try buffing it instead. To avoid wax building up in light traffic areas or beneath furniture only apply wax to these areas at every other waxing session. Do wipe up any spills immediately with a slightly damp cloth. To prevent furniture scuffing and scratching your wood floor apply felt protectors beneath furniture legs. Be sure to replace these on a regular basis, however, as debris and dirt can become embedded on felt pads and act like sandpaper. When moving heavy furniture never slide it across a wood floor. Instead, seek the assistance of another person and lift it to its new position so as to avoid scratching the floor or slide it on a cloth. Avoid walking on a wood floor with spiked football boots or high heels. The impact is sufficient to put a dent in the floor. If you have wood flooring in your kitchen then always place an area mat in front of the sink as this is an area that receives a lot of traffic. While hardwood timber is convenient and stylish, it’s also very delicate and prone to damage caused by high traffic, furniture moving, spills and other activities. In cases like these, you can trust Carpet Cleaning Kings to clean and restore your floors. We understand timber and have the right products and equipment to get your timber floors sparkling like new once more. We also have experience in cleaning timber decks. Speaking of which, should you be considering installing a deck to optimise your outdoor space, then we have no hesitation in recommending one of our business associates Additions. This Brisbane based company specialise in designing and building decks to complement your home. Why not take a look for yourself by clicking on the link Additions decks Brisbane.